From left: Ralph Vallente, Wrigley’s National General Trade Manager, Errol Rivera, Mars’ National General Trade Manager, Jose Amado Dominguez, Wrigley’s General Manager, Eduardo Mendoza, TSPI’s Executive Director, and Henry Azcarraga, Mars’ Country Manager. TULAY sa Pag-unlad, Inc. (TSPI) together with Wrigley Philippines, Inc. (Wrigley) and Mars Philippines, Inc. (Mars), have joined their efforts and resources to roll-out Project Bloom, a program geared towards providing micro-enterprises with established distribution channels of consumer goods such as candy, chewing gum, chocolates, and other confectionary. The project also aims to provide access to subsidized prices on these goods to help micro-entrepreneurs increase their income. 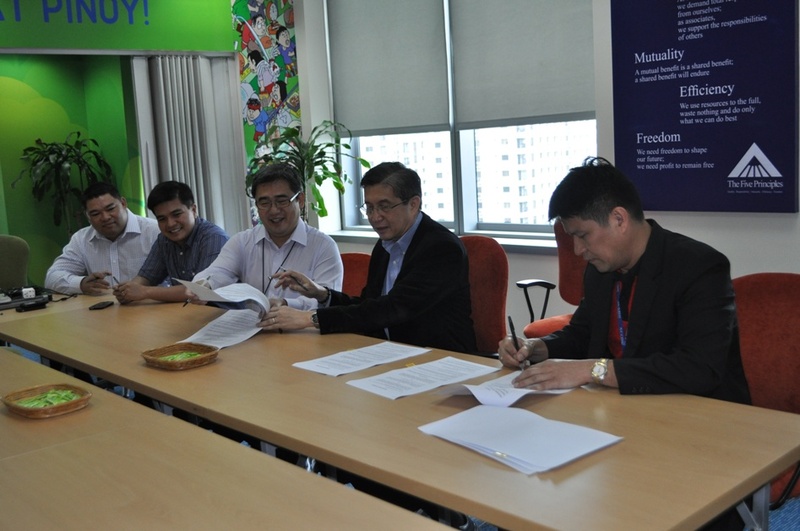 A Memorandum of Agreement (MOA) was signed by TSPI’s Executive Director Eduardo Mendoza, Mars’ Country Manager Henry Azcarraga, and Wrigley’s General Manager Jose Amado Dominguez at Wrigley’s corporate office in Taguig City last August 5, 2014. Project Bloom’s pre-pilot model shall include three TSPI clients identified as primary distribution channels for the goods or “stockpoints” in the Lower Bicutan, Signal Village, and eastern Taguig areas. Prior to the MOA signing, a one-day product orientation and training was conducted at TSPI’s Taguig branch for the Project Bloom entrepreneurs as well as key officials from TSPI, Wrigley, and Mars. The project is in line with TSPI’s strategic direction to extend business development assistance to growing micro-entrepreneurs on top of its microfinance services. Present during the MOA signing were Wrigley’s Distribution Operations and Sales Cap Manager Ralph Vallente, Mars’ National General Trade Manager Errol Rivera, and TSPI’s Maria Teresa Perfecto and Sherry Lou Salazar, Deputy Director for Planning and Business Development and Regional Head for NCR Operations, respectively. This article was written by Joanne G. Fajardo, Marketing Communications Supervisor. Photo was captured by Erness Emmanuel D. Guinto, Business Development Officer.